The international media outlets speak of a new Middle Eastern war between Israel and the Palestinian Hamas organization, which rules a tiny strip of Palestine adjacent the Mediterranean Sea that resembles rather a large open-air prison than a state-like entity. Are we really witnesses of a “war” or an attack by a brutal colonial regime against a defenseless and helpless community of people in the Middle East? In order to provide its criminal operations with a veneer of legitimacy, the Israeli government is using war terminology. According to international law, an enemy can be destroyed and killed according to certain principles that are codified in the Geneva Convention of 1949. The State of Israel has ratified these conventions in 1951 but did not ratify the first and the second protocol. Palestine as a non sovereign state is not party to international agreements in general and the Geneva Convention of 1949 in particular. After it had been granted observer status by the General Assembly of the United Nations it applied in 2009 to recognize the jurisdiction of the International Criminal Court (ICC) in The Hague but its application was rejected by the ICC in 2012. The establishment of the so-called Palestinian Authority has not relieved Israel from its international responsibility for the welfare of the people under occupation. Under the laws of occupation, which are incorporated in the Hague Convention (1907) and in the Fourth Geneva Convention (1949), the occupying power bears a general responsibility for the safety and welfare of civilians living in the occupied territory. The laws of occupation apply if a state has "effective control" over the territory in question. A certain area may be deemed occupied even if the army does not have a fixed presence throughout the whole area. Effective control may also exist when the army controls key points in a particular area, reflecting its power over the entire area and preventing an alternative central government from formulating and carrying out its powers. By enclosing the Gaza Strip and preventing its inhabitants to enter and exit from that area, Israel exercises „effective control“ over this area. The attack against the population of the occupied Gaza Strip by the Israeli occupiers disregards both norms of humanitarian law and norms of human rights that it must respect towards the captive population of Gaza. Such an attack does not constitute war but gross violations of human rights and humanitarian norms, which may amount to crimes against humanity under customary law. The ineffectual rocket attacks by Hamas against Israeli targets are militarily irrelevant and do not transform the relationship between the captive population of Gaza and the Israeli State into an international conflict or war. 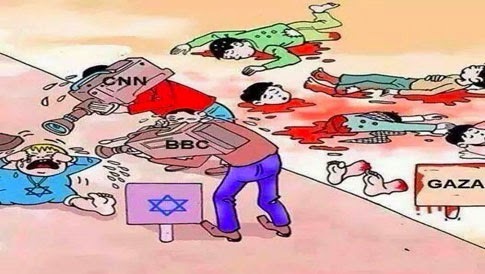 Many well-meaning observers have rightly pointed out the huge discrepancy between the hapless rocket attacks by Hamas and the massively deadly Israeli bombings of Gaza, often disregarded by Western media. Such focus obfuscates the responsibility of Israel under international law towards the population of Gaza and tends to limit Israel’s breaches to that of using excessive force. Within a five year period, Israel has launched the third devastating attack on the ruling Hamas government and on the population of the Gaza Strip without any convincing results. Israel’s political leadership pretends that it wants to destroy the “terrorist” infrastructure. But is this really the case? Can’t Hamas be seen as an implied ally of Israel? The Israeli government needs Hamas as a pretext not to seek peace. This could be seen immediately after Fatah and Hamas formed a unity government. Netanyahu right away started demonizing Hamas but to no avail. This time the Obama administration and the European Union did not fall in line with his extremist stance and kept on working with the Palestinians. What Netanyahu wishes, however, is to demoralize the population of Gaza and prod it to acts of despair against Hamas. According to Israel’s defense minister Moshe Ya’alon, the next agreement with Hamas will be signed exclusively on Israeli terms. This attitude shows, however, the political stubbornness of some Israeli politicians in regard to peace with the Palestinians. The rejectionism of the political and military ruling elite has been a key element of all Israeli governments since the proclamation of the State of Israel. When this massacre of the population of Gaza will be over, “peace talks” must be resumed to solve the Middle Eastern problem. In order to achieve a comprehensive arrangement, the partners have to tackle not only the exclusivist and expansionist Zionist ideology, but also some teachings of Judaism. The late Israel Shahak has shown in his groundbreaking book “Jewish History, Jewish Religion. The Weight of Three Thousand Years” (Pluto Press 1994; fourth edition 2008), that the latent racism within Israeli society does not derive alone from Zionism but is inherent in some teachings of Judaism. Although this raises politically awkward questions, they need to be addressed anyway. By the way: Don’t the US and its Western allies bear responsibility for the behavior of a jingoistic Israeli leadership that pretends to belong to a so-called community of shared values? If this holds true, shouldn’t one exclude the alleged partner, before losing the last remaining of his own credibility?